For any early risers on Sunday, I’ll be signing copies of my collaboration with Toronto based writer and freintor Jeff Parker between noon and 1 at the NY Art Book Fair. My only real stabs at writing fiction outside of the confines of my art were under Parker’s brief guidance at Syracuse University, where he was a couple of years older and already had a BA. His office hours at the bar gave way to plain old drinking and we kicked around some ideas before I headed down to New York. Several years later, Parker asked me to do some drawings for a short story collection, The Back of the Line. 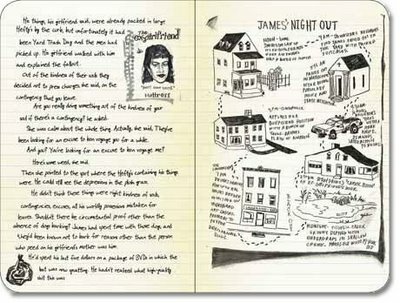 The stories were rife with documents and the characters were all-too familiar, so I made a series of James’ Drawings, which are some of my favorite drawings. The book itself, looks like a ragged little chapbook and was designed by Stephen Lyons and John Jenkins at DECODE INC. 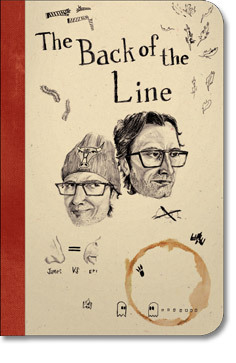 They also published The Back of the Line as well as a new series of beautiful, art photography books including one by Jesse Burke who is signing at 4pm on Friday. If you are at the fair between noon and 1 on Sunday though, drop by and I’ll put my stamp on yer copy. If not, you can always pick one up at the DECODE booth at the fair and track me down later. Of the text, I’ll say Parker’s narrative cracks open the inner lives of the co-dependent protagonists and peers into their ramshackle little world of laundromats, cockateil ghosts, relationship interviews, moped vandalism, and life on the verge of responsibility. If social anarachy were the rule, not the exception, James would be a hero, but it isn’t so he’s not and that’s why I like him so much. I had a great deal of fun authoring small details that extend and perhaps undermine the exploits of the fictional narrator and James, who is the kind of guy who’d date your ex-girlfriend and still come over for a beer. I’m not the most reliable narrator and neither is James. By the way, Parker is also the author of Ovenman, a novel about a pizza cook who blacks out and sticks cryptic post-it notes on himself, which then, like the rest of his life, he must unravel and figure out each day. It’s published by Tin House, and you can find it in book stores.